EBUS students, parents and teachers participated in the 2018 annual White Sturgeon Release in Vanderhoof on Friday May 4th! 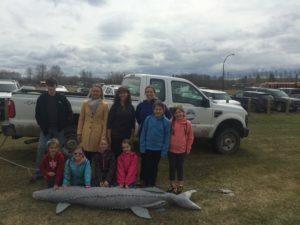 Hundreds of juvenile sturgeon were released into the Nechako River as part of the Nechako White Sturgeon Recovery Initiative. Students learned about why sturgeon populations are at risk, the Nechako River ecosystem and many more amazing facts about white sturgeon! You can learn more about the recovery initiative at https://www.nechakowhitesturgeon.org.